Duelist Pack: Yusei 2 is a Duelist Pack in the Yu-Gi-Oh! Official Card Game (OCG) and Yu-Gi-Oh! Trading Card Game (TCG). It is the ninth set in the OCG's Duelist Pack series, following Duelist Pack: Yusei. In the TCG, it is the tenth set, following Duelist Pack: Yugi. The set features 5 new cards used by the Yu-Gi-Oh! 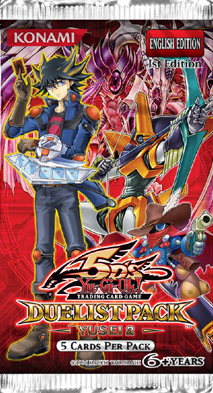 5D's main protagonist Yusei Fudo in the anime.